76th Golden Globe Awards 2019 – Television – Comments, Opinions and Who Deserves to Win? I had almost forgotten about the Golden Globes. I hadn’t ever realised it was December and that the nominations would have been announced soon! I am so excited! 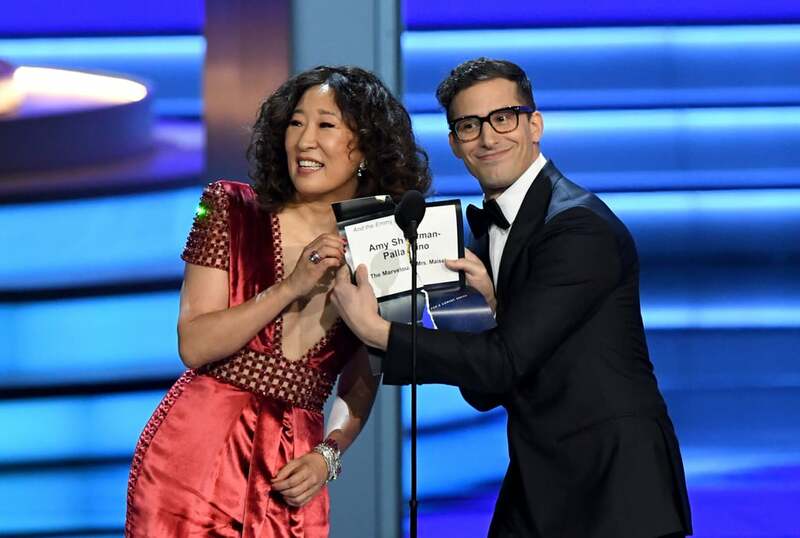 I am in love with Andy and it was clear from their adorable moment presenting the Emmys in September, that they had chemestry and worked together well. Thank you NBC for giving it to Andy. I hope it will boost the ratings for the upcoming 6th season of Brooklyn99! The ceremony will be broadcast on NBC, Sunday 6th of January at 5 PST/8 EST. It’s my third year talking about the Globes! I wrote about them both in 2017 and in 2018! Henry Wrinkler is nominated for his role on Barry! I love him. He did such an amazing job and the whole show is absolutely BRILLIANT! It’s so clever and devastatingly funny. I think he deserves to win, even though I am only familiar with his performance and Edgar Ramirez for “The Assassination of Gianni Versace“. The women’s category is a tougher to choose from! I’m torn between Alex Borstein in “The Marvelous Mrs Maisel” and Yvonne Strahovski in “The Handmaid’s Tale”. Both incredible performances, two different categories so it’s hard to compare them. Although I would love for Alex to win, I do think it should go to Yvonne. She was magical on “The Handmaid’s Tale“. Absolutely divine. I’m so excited Bill Hader and Donald Glover were nominated. They both created brilliant, innovative and original shows. And although I looooove Bill and thin he deserves the world, I think it should go to Glover. He was SOOOOOOO snobbed at the Emmys. He came dressed at Teddy Perkins! KRISTEN BELL IS NOMINATED! WOOOOOO!!! I am so thrilled for her! “The Good Place” is an incredibly smart and funny show! I hope she wins. It is highly improbably she, or Debra Messing (also nominated for her role as Grace Adler on “Will and Grace“) will stand a chance against Rachel Brosnahan. It seems like she wins every price she is nominated for! (See the Emmys!). I am happy for her, obviously! I’m totally obsessed with The Marvelous Mrs. Maisel! I have no opionions about the man category… aside from wanting, with all my heart, for Bill Porter to win! I love POSE! Who cares about Richard Madden and Matthew Rhys! (Sorry guys but no. “Bodyguard” is drenched in islamophobia and I don’t care about The Americans). And now the ladies! Sandra Oh is nominated for her role in “Killing Eve” and Elizabeth Moss for “The Handmaid’s Tale“! Moss has already won quite a lot of prices in the past two years and it’s time to let Sandra Oh shine! DID YOU SEE KILLING EVE?! I MEAN! Her performance was mesmerizing! I don’t really care about this category to be honest. I did watch “The Assassination of Gianni Versace” and “The Alienist” but none of them blwe my mind. I have read the book “Sharp Object” and I’m planning to watch it after I’ve forgotten what happens in it. I’m happy it’s not the same shows tha are being nominated! Aside from “The Americans”, they are all from 2018! KILLING EVE is NOMINATED! POSE is NOMINATED! and those are the ones I care about. I might try and watch Bodyguard just to understand the reason why i was nominated. I can’t just be thanks to Richard Madden’s hotness. THE GOOD PLACE IS NOMINATED!!! FOR A GOLDEN GLOBE! While in itrs 3rd season! This is unbelievable… I love it. Just because The Marvelous Mrs Maisel has won so many awards already, I’d love it for Barry or The Good Place to win. I do hope The Good Place wins. Will you be watching the Golden Globes? They are pretty white, these Globes… that’s the first thing I’ve noticed. I mean, you’d think they’d learn, don’t ya? Let me know in the comments who YOU would like to win and, in your opinion, who deserves it!